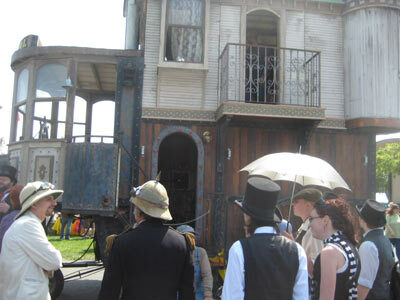 The Neverwas Mansion and crew. There were several dedicated "make something here" areas. 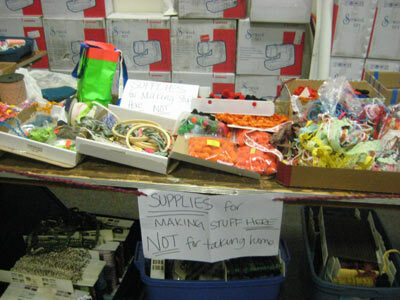 This was a supply table for the fabric/design/sewing area. They had 9 sewing machines set up and all of them were in use. In the next room, a really sharp, interesting gang of indie vendors were set up, with clothing, shoes, stationary and other items. One vendor caught my eye and gave me a big, friendly greeting, "HEY! How is it going! How is your wife?" I didn't really recognise her, but returned the greeting because I am terrible at remembering names and faces. I guessed that she might have recognised me from my website, but I wasn't sure because her manner was "we know each other". I introduced her to my wife, who did not look like the woman she was expecting. Ah! By this time we were both laughing, but she was trying to figure out if I looked like someone she knew, or if it was possible that we actually knew each other from somewhere. "Do you have a blog, maybe?" "Well, it could be my website, Cockeyed.com?" I remarked, "I'm HUGE on the internet", I stated, trying to sound like I was mocking the person that would actually say that. "Cockeyed" didn't sound familiar to her, so we shrugged our shoulders and moved on. That night, after the fair, she emailed. She had figured it out! She did know me from the internet! I applaud your ability to track down that memory and willingness to come forward with this potentially embarrassing story Willo O'Brien (of Willotoons)! It was a high-point of the day for me! I ran into Eunice of Hello! Lucky (Wedding Invitations, Birth Announcements And Letterpress Greeting Cards) fame and Daniel James of Three Rings (online multi-player games) infamy. We got caught up on current events and kept going back to how incredible the Maker Faire had become in just three years. My favorite vendor, probably my favorite thing in the entire fair, was the Postcard vending machine, a fun way to buy a postcard. She had an absolutely A+ comedy routine going. I almost missed what was special about the drummer outside the bizarre bazaar...he was knitting! Our final two rooms had a pinball pavillion and some horror-based makeup and animatronics. 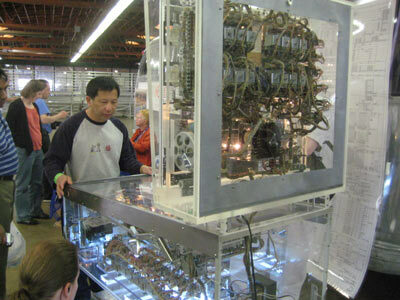 Also, this transparent pinball machine. Rising Ghoul - This was one of a few halloween-themed Maker displays. This giant animated ghoul rose from a seated position and menaced the crowd. His cloak was removed so that the crowd could witness his control mechanisms and hydraulics in action. Pinball Bowl - This was really brilliant, a simple transparent bowl fitted with five pinball bumpers. Complete with neon lights, it is the best sound/light combo I've ever seen in a kinetic sculpture. 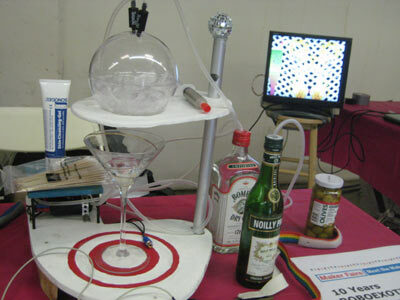 And at the end of a long fair, what better way to wind down than with a MINDtini from the mind-reading martini contraption! 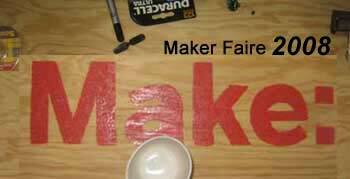 Another great year for the Maker Faire. The day began with a few hitches, but once we were inside, it was well worth the effort. I'm already looking forward to the next one. Back to page 1 of the 2008 Maker Faire.